This Comprehensive Purchase Agreement is designed for the acquisition of a manufacturing plant by an investor lender, who will then lease the property back to the operator seller tenant. This sale leaseback transaction is essentially a financing transaction. The Purchase Agreement has extensive definitions for defined terms in the agreement, and contains elaborate Seller representations and warranties. THIS PRODUCT IS ALSO PART OF DISCOUNT POWER PACK 23: SALE LEASEBACK OF MANUFACTURING PLANT WHICH CONTAINS COMPANION DOCUMENTS AT A SUBSTANTIAL DISCOUNT. Sale Leaseback Property to be acquired by the lender investor, then immediately leased back to the seller tenant operator. THIS PURCHASE AGREEMENT (the “Agreement”) is dated as of _______________ (the “Effective Date ”) by and between SALE LEASEBACK SELLER, a __________ corporation, ( the “ Seller ”), and SALE LEASEBACK BUYER, a __________ limited liability company (the “ Purchaser ”). “Acquisition Date” means the date, which shall occur no later than ________________, on which Purchaser acquires all assets and interests in the property comprising the Property. “Appurtenances” means, with respect to the Property, all tenements, hereditaments, easements, rights-of-way, rights, and privileges in and to the Land, including (a) easements over other lands granted by any easement agreement and (b) any streets, ways, alleys, vaults, gores or strips of land adjoining the Land. “Building Equipment” has the meaning assigned to such term in Section 2.1(c). “Closing Date” means the date the Property is acquired by Purchaser. “Closing” means the final acquisition of the Property by Purchaser. “Environmental Laws” has the meaning assigned to such term in the Lease. “Environmental Violations” has the meaning assigned to such term in the Lease. “Existing Environmental Conditions” has the meaning assigned to such term in the Lease. “Guarantor” means ______________, a __________ corporation. “Hazardous Substances” has the meaning assigned to such term in the Lease. “Improvements” has the meaning assigned to such term in Section 2.1(b). “Closing” has the meaning assigned to such term in Section 2.4. “Closing Date” has the meaning assigned to such term in Section 2.4. “Property” means the property shown in the plan attached hereto as Exhibit A. “Land” means the parcels of land comprising the Property more particularly identified in Exhibit B. “Landlord” has the meaning assigned to such term in Section 6.1(d). “Lease” means the Lease Agreement between Purchaser, as landlord, and Seller, as tenant, entered into pursuant to Section 2.3. 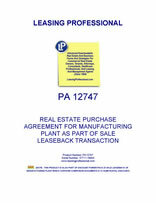 “Lease Guaranty” has the meaning assigned to such term in Section 2.4. “Loss” has the meaning assigned to such term in Section 8.2. “Property” has the meaning assigned to such term in Section 2.1. “Purchase Price” has the meaning assigned to such term in Section 2.2. “Taking” has the meaning assigned to such term in Section 8.3. “Tenant” has the meaning assigned to such term in Section 5.3(b). “Trade Fixtures” means all machinery, apparatus, furniture, fixtures and equipment now or hereafter installed by Seller and used in connection with the conduct of Seller's business on the Property, other than fixtures and items of personal property that are integral to the ownership, maintenance and operation of the Improvements and which cannot be removed from the Property without adversely affecting the value, or the general utility or use of the Property. “Title Policy” has the meaning assigned to such term in Section 5.1. “USA Patriot Act” means the Uniting and Strengthening America by Providing Appropriate Tools Required to Intercept and Obstruct Terrorism Act of 2001. 2.2 Purchase Price. The purchase price for the Property (the “Purchase Price”) shall be _______________________ Dollars ($__________). On the Closing Date, the Purchase Price shall be due and payable to Seller by wire transfer of immediately available U.S. funds. 2.3 Leaseback. On the Closing Date, Purchaser, as landlord, and Seller, as tenant, shall enter into a Lease of the Property substantially in the form attached hereto as Exhibit E .
2.4 Lease Guaranty. On the Closing Date, Guarantor shall guarantee the obligations of Seller, as tenant under the Lease by executing a guaranty agreement substantially in the form attached hereto as Exhibit F (the “ Lease Guaranty ”). 2.5 Closing. Seller and Purchaser shall consummate the transaction contemplated by this Agreement with respect to the Property (the “ Closing ”) on ___________ (the “ Closing Date ”). (cc) Seller (i) is not a person or entity with whom Purchaser is restricted from doing business with under regulations of the Office of Foreign Asset Control (“OFAC”) of the Department of the Treasury (including, but not limited to, those named on OFAC's Specially Designated and Blocked Person s list) or under any statute, executive order, rule or regulation of or administered by OFAC or any other government entity (including, but not limited to the September 23, 2001 Executive Order Blocking Property and Prohibiting Transactions with Person Who Commit, Threaten to Commit, or Support Terrorism, the USA Patriot Act, and the Currency and Foreign Transactions Reporting Act (commonly known as the Bank Secrecy Act) as any of the foregoing has heretofore been amended), or other governmental action, comparable laws, rules, regulations ordinances, orders, treaties, statutes or codes promulgated pursuant to any of the foregoing; (ii) is not knowingly engaged in any dealings or transactions, or otherwise be associated, with any persons or entities described in (i) above; and (iii) is not in breach in any material respect of any provision of the International Money Laundering Abatement and Financial Anti-Terrorism Act of 2001 or the regulations or orders thereunder, if any, applicable to Seller. Seller acknowledges and agrees that the foregoing representations and warranties constitute a material inducement to Purchaser to enter into this Agreement. Seller further acknowledges and agrees that the representations and warranties set forth above shall survive the Closing for a period of one (1) year after the Acquisition Date. Seller agrees to indemnify, defend (with counsel reasonably acceptable to Purchaser) and hold Purchaser harmless from and against all damages, costs, expenses, claims and liabilities paid or incurred by Purchaser (including, but not limited to, reasonable attorneys' fees and costs) as a result of any representation or warranty set forth above not being true and correct. (g) Purchaser (i) is not a person or entity with whom Seller is restricted from doing business with under regulations of OFAC (including, but not limited to, those named on OFAC's Specially Designated and Blocked Person s list) or under any statute, executive order, rule or regulation of or administered by OFAC or any other government entity (including, but not limited to the September 23, 2001 Executive Order Blocking Property and Prohibiting Transactions with Person Who Commit, Threaten to Commit, or Support Terrorism, the USA Patriot Act, and the Currency and Foreign Transactions Reporting Act (commonly known as the Bank Secrecy Act) as any of the foregoing has heretofore been amended), or other governmental action, comparable laws, rules, regulations ordinances, orders, treaties, statutes or codes promulgated pursuant to any of the foregoing; (ii) is not knowingly engaged in any dealings or transactions, or otherwise be associated, with any persons or entities described in (i) above; and (iii) is not in breach in any material respect of any provision of the International Money Laundering Abatement and Financial Anti-Terrorism Act of 2001 or the regulations or orders thereunder, if any, applicable to Seller. (i) Seller shall have executed and delivered such other documents or instruments as may be required under this Agreement, by the Title Company or as otherwise required in Purchaser's reasonable opinion, to effectuate the Closing. (n) Seller shall have executed and delivered such other documents or instruments as may be required under this Agreement, by the Title Company or as otherwise required in Purchaser's reasonable opinion, to effectuate the Closing. (e) Purchaser shall have executed and delivered such other documents or instruments as may be required under this Agreement, or by the Title Company to effectuate the Closing.